President Trump’s protectionism has a distinctive focus on disrupting US access to global supply chains. This column reveals that the major economies had in fact begun to impose additional trade protection on intermediate inputs even prior to 2016. New barriers targeting cross-border supply chains simply arose through policies aside from headline tariffs. Some of this new protection has also already spread beyond China’s trade and begun to cover exports from other countries. These results, combined with more recent policy actions, widen the possibility of a negative protectionist impact on the global sourcing of parts and components. Trump’s approach runs counter to the strategy that governments have adopted almost globally in recent decades: keep tariffs on inputs low. This facilitates domestic access to foreign-produced components and contributes to the competitiveness of local industry. Indeed, supply chains expanded across borders considerably during this period when countries erected low barriers on imported intermediates and took on legal commitments to keep them low via international trade and investment agreements (Johnson and Noguera 2017, Osnago et al. forthcoming). But in Bown (2018b) I present new evidence that suggests that this is not the entire story. Hidden behind unchanging tariff policies, governments had begun to use other types of restrictions to curtail trade in intermediate inputs. It was taking place even before Donald Trump and not only in the US. Notes: Simple average applied MFN tariff constructed from 6-digit Harmonized System data. Final, intermediate, and capital goods are taken from Broad Economic Category (BEC) definitions. Source: Bown (2018b, Figure 2). The rank ordering of tariffs across product categories is clear: on average, countries impose lower tariffs on capital equipment than on intermediates, which are much lower than those applied on imports of final goods, like consumer items. The evidence of Figure 1 confirms earlier, cross-sectional research documenting the patterns of higher tariffs on final goods relative to intermediates arising even within industries (Bown and Crowley 2016). Finally, emerging economies also tend to apply higher tariffs than high-income economies across each category of products. The main take-away for supply chains is that the seemingly ubiquitous ranking of higher applied MFN tariff protection for final goods relative to inputs did not budge in the lead-up to 2016. Notes: Shares are trade-weighted import coverage ratios *Does not include TTBs applied by China or by Saudi Arabia. Source: Bown (2018b, Figure 4). Three pieces of evidence stand out from Figure 2. First, a new result is that the TTB protection covering imported intermediates is frequently higher than the TTB coverage of final goods. And since 2010, there has been an increase in TTB protection covering imported intermediate inputs relative to final goods. Overall, the consistent ranking of applied MFN tariffs summarised by Figure 1 is not apparent for the protection arising under TTB policies. Second, the figure confirms the well-established result that both high-income and emerging economies impose this type of trade protection disproportionately against China’s exports. Overall, roughly 6% of both high-income and emerging economy imports from China were covered by TTBs by 2016. TTBs covered less than 2% of imports from the rest of the world. Yet, third, governments applied TTBs on an increasing share of imports from countries aside from China between 2010 and 2016, including on intermediate inputs. This evidence is also new. In summary, trade restrictions increasingly targeted cross-border supply chains, and they were pushing beyond China’s exports to hit global trade in parts and components. This phenomenon was arising across policy-imposing countries and even before the election and protectionist policies of Donald Trump. And of course, protection that may disrupt established supply chains has moved well beyond even these TTB policies of anti-dumping, anti-subsidy duties, and safeguards since 2016. Now notorious are the Trump administration’s special “national security” and “China unfair trade” tariffs that target inputs.8 But consider even the administration’s push for modifications of the North American Free Trade Agreement. The automobile rules of origin requirements and labour value content provisions in the newly announced US-Mexico-Canada Agreement are also likely to curtail trade in intermediate inputs in the sector (Bown 2018d). Finally, outside the region, there is also the potential for the UK’s Brexit negotiations to result in new tariff and non-tariff barriers on pan-European trade in intermediate inputs (Vandenbussche et al. 2017). The trade policy threat to cross-border supply chains is clearly on the rise. But somewhat surprisingly, many of its signs were apparent even before Trump. Baldwin, R (2018), “Trump can’t fix a 21st century problem with 20th century thinking ”, VoxEU.org, 27 September. Bown, C P (2016), “Should the United States Recognize China as a Market Economy? " Peterson Institute for International Economics Policy Brief 16-24, December. Bown, C P (2018a), “For Trump, it was a summer of tariffs and more tariffs. Here’s where things stand ”, Washington Post, 17 September. Bown, C P (2018b), “Trade Policy Toward Supply Chains After the Great Recession ”, IMF Economic Review, forthcoming. Bown, C P (2018c) “Trump’s Steel and Aluminum Tariffs Are Counterproductive. Here Are 5 More Things You Need to Know ”, PIIE Trade and Investment Policy Watch, 7 March. Bown, C P (2018d) “The 5 Surprising Things about the New USMCA Trade Agreement ”, Washington Post, 9 October. Bown, C P (2018e) “Donald Trump’s Solar and Washer Tariffs May Have Now Opened the Floodgates of Protectionism ”, Washington Post 25 January. Bown, C P and M A Crowley (2016) “The Empirical Landscape of Trade Policy ”, Chapter 1 in K Bagwell and R W. Staiger (eds), The Handbook of Commercial Policy, vol 1A. Amsterdam, Elsevier, North Holland. Bown, Chad P, Eujin Jung and Zhiyao Lu (2018) “Trump and China Formalize Tariffs on $260 Billion of Imports and Look Ahead to Next Phase ”, PIIE Trade and Investment Policy Watch, 20 September. Bown, Chad P and Soumaya Keynes (2018) “Aluminum Made in the USA ”, Trade Talks Episode 50, PIIE, 10 August. Johnson, Robert C. and Guillermo Noguera (2017) “A Portrait of Trade in Value Added over Four Decades ”, Review of Economics and Statistics 99(5): 896-911. Osnago, Alberto, Nadia Rocha, and Michele Ruta (forthcoming) “Deep Agreements and Vertical FDI: The Devil is in the Details” , Canadian Journal of Economics. Krugman, Paul (2018) “How to Lose a Trade War ”, New York Times, 7 July. WTO (2011) World Trade Report 2011: The WTO and Preferential Trade Agreements: From Co-Existenceto Coherence . Geneva: WTO. For more details on the aluminum industry, see Bown and Keynes (2018). For the Trump administration’s 2018 tariffs on China, see Bown et al. (2018). For its 2018 tariffs on steel and aluminum, see Bown (2018a). For trade policy purposes, the G20 is made up of Argentina, Australia, Brazil, Canada, China, European Union, India, Indonesia, Japan, Mexico, Russia, Saudi Arabia, South Africa, South Korea, Turkey, and the United States. 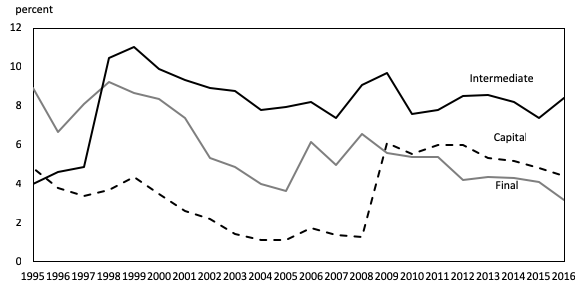 Using 2007 data on preferential trade agreements, WTO (2011) estimated that 84 percent of world merchandise trade (not including intra-EU trade) was still taking place on an MFN basis. For a general introduction to TTB policies, see Bown and Crowley (2016). The average US antidumping duty in effect in 2015 against China was 81.4% and against non-China it was 54.3% (Bown 2016). 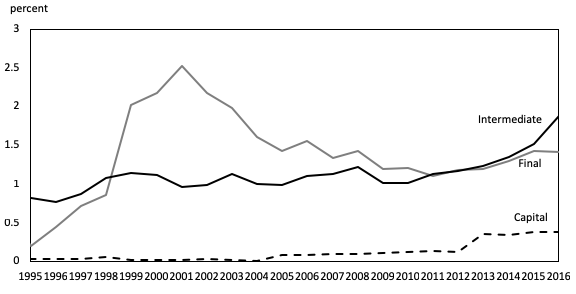 See Bown (2018c) for US use of TTBs on steel over 1995-2017, which increasingly applied to imports from non-China as well. See Bown (2018b, Figure 5). As another example, the US application of a global safeguard on solar panels in 2018 followed a series of country-specific antidumping restrictions imposed since 2011 that had led to trade diversion (Bown 2018e). The special US tariffs on steel and aluminum were applied under Section 232 of the Trade Expansion Act of 1962 and the tariffs on $250 billion of imports from China were applied under Section 301 of the Trade Act of 1974.